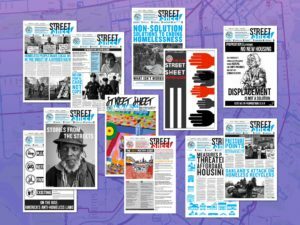 Home Street Sheet > Uncategorized > AFTER A STORMY MEETING, A SAFE HARBOR FOR HOMELESS PEOPLE? On one side, there were opponents of the shelter who are housed in adjacent, affluent neighborhoods along The Embarcadero, most of whom wore orange stickers that read “Safe Embarcadero.” Representing the other side were shelter proponents who carried pink paper signs that read “Hate has no home here.” The supporters held the signs whenever opponents booed and jeered during the City’s presentation. On April 23, the Port Commission will decide whether to allow a temporary structure that would accommodate around 200 homeless San Franciscans in what is being billed as a “SAFE Navigation Center.” If the commission approves, it would be the fifth active low-threshold shelter with case management and supportive services. Despite his initial reservations about the size of the center, District 6 Supervisor Matt Haney said that unhoused people in the area would benefit from the amenities. But what’s different about this SAFE center — Breed’s acronym for “Shelter Access For Everyone” — from previous navigation centers is the proximity to high-income housing and tourist attractions. The visible homelessness in the area has already raised the hackles of luxury condo dwellers. The possibility of a facility lodging previously unsheltered people has prompted a GoFundMe campaign to hire Zacks, Freedman & Patterson PC, a law firm that describes itself as “the voice of Bay Area property owners.” So far, that campaign has raised over $100,000, while a competing GoFundMe by former Google publicist William Fitzgerald is closing in on $175,000 (Disclosure: Funds will be donated to the Coalition on Homelessness, a homeless advocacy organization that publishes Street Sheet). Shelter naysayers groaned during presentations of the shelter design, including landscaping, translucent roofing, noise-masking fabric, an outdoor garden and dog-run area. Homeless advocates at the meeting were audibly put off when SFPD Lt. David Lazar, who commands the Healthy Streets Operation Center, told the audience there will be heavy police presence in the area. Already, placements to existing navigation centers are prompted by neighbors’ complaints about encampments. Lazar’s unit takes the lead in camp sweeps and has been criticized for seizing tent dwellers’ possessions. Even when Lazar said that no connection of homelessness to increased crime existed, it didn’t seem to mollify anyone. Just before the two-hour meeting ended, several opponents walked out en masse.